CVSA hosted this film screening in NYC in 2015 and is still a movie you should see if you haven't yet! This is a must-see film for anyone involved in volunteer service, social change, or just plain cares about getting medical care to people! Click the image for the trailer. Remote Area Medical and the schedule of film screenings around the country. Our September 26th Screening at Columbia University School of Social Work in New York was standing room only! Call CVSA about screenings of this inspiring film! 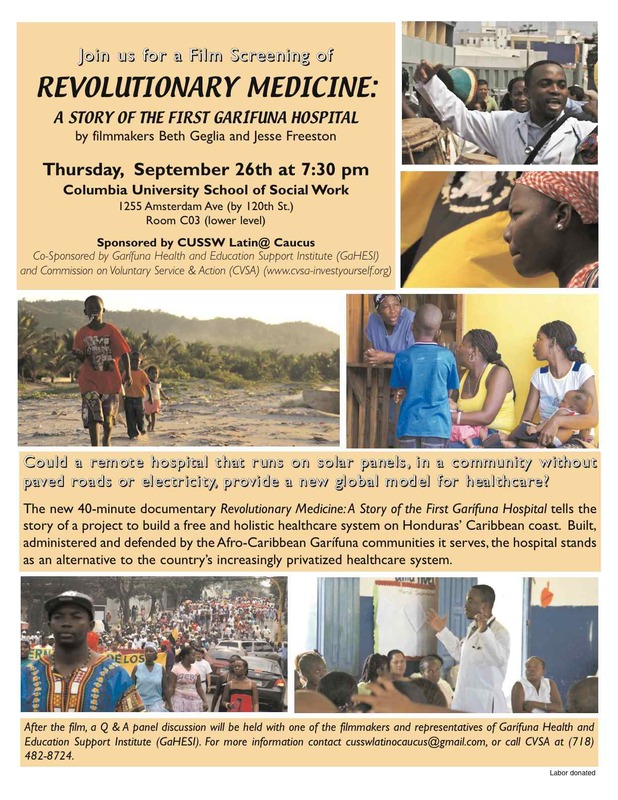 The new documentary "Revolutionary Medicine: A Story of the First Garifuna Hospital" tells the story of a project to build a free and holistic healthcare system on Honduras's Caribbean coast. Built, administered and defended by the Afro-Caribbean Garifuna communities it serves, the hospital stands as an alternative to the country's increasingly privatized healthcare system. Dr. Luther Castillo, medical doctor, community organizer, full-time volunteer, founder of the First Popular Garí﻿﻿funa Hospital serving the marginalized and indigenous communities of the north coast of Honduras, spoke in New York City the week of September 6th through 12th, 2012, at Trinity Church on Wall Street, New School University, Columbia University School of Social Work, Weill Cornell Medical School and NYU Center for Global Affairs about the struggle for access to health care as a human right in Honduras. These events were organized and co-sponsored by CVSA and the NY Support Committee for the First Popular Garí﻿﻿funa﻿ Hospital. To learn more, see article about Dr. Castillo's work and the First Popular Free Garí﻿﻿funa﻿ Hospital in Honduras in Spring 2013 CVSA newsletter ITEMS, and also more background in the Summer 2012 edition of CVSA's newsletter ITEMS. GAIN a new understanding of global warming, the immense inequality in people’s access to resources for survival world-wide and the urgent call for systemic change. LEARN from the film how all the links that make life possible on earth are being broken… and how little time we have left to reverse this condition. DISCUSS what actions are being taken by non-government organizations and what you can do. Contact CVSA for information about holding a screening of HOME at your school, church, campus, club.